Pahiyas Festival is a colorful feast in honor of San Isidro Labrador, the patron saints of farmers, as a thanksgiving for a bountiful harvest. The Lucbanons come up in different designs every year, as they showcase their artistic talents in decorating their houses. 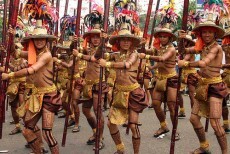 The Pintados-Kasadyaan Festival or Pintados Festival is celebrated every 29th of June at Tacloban City, Leyte. Here, the citizens of the Leyte from different towns and municipalities all gather together and cover themselves in colorful and artistic tattoos. 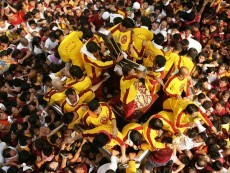 Feast of the Black Nazarene is held every 9th of January in Quiapo, Manila. Devotees of that number in the thousands flock around the life-size statue of the Black Nazarene (Jesus Christ) as it inches across the streets packed with devotees around Quiapo church. Devotees attribute many miracles to this 400 year old image which was brought to the the Philippines from Mexico in the 7th century. 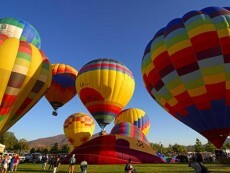 The 2012, 17th Annual Clark Freeport Hot Air Balloon Festival held in Clarkfield, Clark Zone, Pampanga, Philippines from February 9 to 12. The Malasimbo Music & Arts Festival is set in the tropical paradise of Puerto Galera. This three-day event showcases talents from both the local and international music scene. It is set on March 2-4, 2012 at the Puerto Galera beach grounds. Sandugo Festival is a yearly historical event that takes place every year on the month of March, in the island of Bohol. 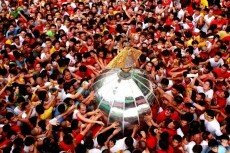 It is a celebration of Datu Sikatuna's and Miguel López de Legazpi blood compact in March 16, 1565. 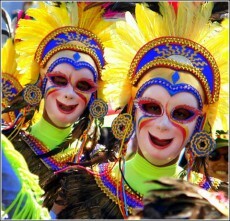 Davao's annual festival, Kadayawan Sa Dabaw assures another weekend of trumpet blast and fun - tribal style. 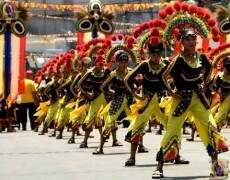 Watch as the festivities reach a glorious peak on Saturday morning: that's when the Kadayawan parade is held, featuring colorful, orchid-bedecked floats and more than a dozen "ethnic" groups dancing to the beat of wooden drums. Bicol Region's largest celebration is an annual affair that combines religion with culture and tradition, stuffing it all in a 9-day fiesta of biblical proportions. Stay until sundown for stirring climax: the fluvial parade as it makes its way down the river, surrounded by a sea of glowing candles - a fitting end of this truly spiritual occasion.